Black Country Living Museum (BCLM) is an award winning open air museum that tells the story of industrial developments in and around Dudley and the West Midlands. Spanning a landscape of over 26 acres the museum has been open to the public for 34 years and is the UK’s third most-visited open-air museum. It welcomes more than 300,000 visitors through its gates each year. In October 2012, £4.5m of European funding was awarded towards the redevelopment of the Castle Hill site to create shared visitor facilities. The project revolved around creating new access and infrastructure to create one shared arrival point for visitors to Dudley Zoo and Castle, the Black Country Living Museum and the Dudley Canal Trust. As part of the project, Dudley Metropolitan Borough Council had appointed specialist landscaping and civil engineering company, Jack Moody LCE Limited as the main contractor for a vehicular width pathway linking the Dudley Canal to this highly popular tourist attraction. Alpha Rail was appointed to manufacture and supply metal railings and gates. Alpha Rail provided metal railings and gates to the architect’s exact specification. This included 150m of 2m high arrowhead vertical bar metal railings which were galvanized and powder coated black and a 4m wide x 2m high double leaf gate. 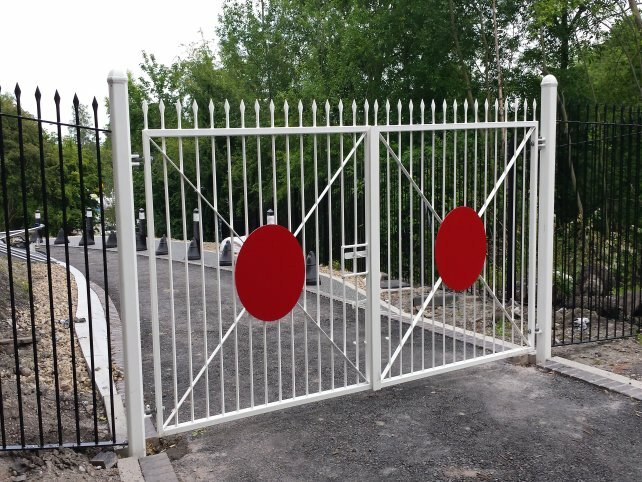 This decorative gate was galvanized and powder coated white with red highlighted circle features. "“The BCLM and the Canal Trust sites are very high profile and well visited tourist attractions and therefore we needed a high quality product that would match the needs of such prestigious venues and stand the test of time. Alpha Rail was the obvious choice due to the difficult terrain. From the outset we had total confidence that Alpha Rail had the expertise and skills required to conduct an accurate survey. When the metal railings and gates arrived on site our installation team was impressed with their high quality and the fact they fitted exactly as per the architect’s technical and design specification. Working with reliable suppliers like Alpha Rail means we can complete projects on time and exceed our clients expectations.”"